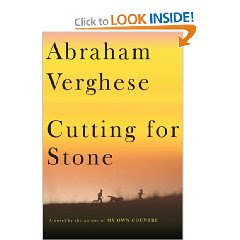 Though this novel exceeds 500+ pages, its story remains relatively simple - Marion and Shiva Praise Stone are twins born to a nun (a nurse) in an Ethiopian hospital. Their mother, Sister Mary Joseph Praise, dies while giving birth. The presumed father, Thomas Stone, is the head surgeon who vanishes after he is unable to save her in the OR. While this may seem to be a rather bleak situation, the book becomes an almost light story about family, love, and medicine. The twins are raised by the hospital's other surgeon and gynecologist, who treat the boys as if they were their own. Everything is hunky-dory until the day when Shiva commits the ultimate betrayal and creates a divide against the two. As the boys age, the political landscape of the country changes drastically, forcing Marion (the narrator) to flee to the United States. It is in this last segment of the novel where Shiva and Thomas Stone are able to experience some kind of redemption for the pain that they caused Marion. Overall, an excellent novel - I was disappointed when I finished. The medical jargon can be a little much at times, but if you're into ER and the like, will be fine.